If you want to keep the Zebra finches as pets, you have to be aware of their needs especially the cage. Normally the height of the cage does not matter but the cage has to have enough room horizontally so that they can be able to fly. Even if you may find different recommendation of the cage sizes when you want to keep a Zebra finches as pets, you have at least to keep a minimum cage of 30 inches long, 18 inches wide with 18 inches high, it will be enough for two zebra finches. If you need to have more than two birds, then you will need to have a flight cage or an aviary. You can build the house yourself or you can get someone to build the bird cage for you. However, you have also to remember to keep the bird cage always clean and you can let the spacing between wires to be enough. If you want to add perches in the bird cage, you have always to remember to separate them enough so that they cannot prevent the bird to fly forth and back. You should have an open flight in the length of the cage. You can use dowels or natural branches for perches. You have to put them in different angles so that their feet do not have to be put in the same manner always when they hang. If you have small clip, you can use them since they can also offer the privacy for an aviary situation and more than one finch can hang on it at once if you are keeping more than one group of Zebra finches as pets. You can add the plants in the cage to offer privacy. You can use silk plants and non-toxic live plants. Ladders and swings can also be included in the cage, but the ladders are normally used as perches. Even if Zebra finches as pets are not too much interested in the toys, you can include in their cages hanging toys and small bells. After getting the cage, then you should also think where to put them. 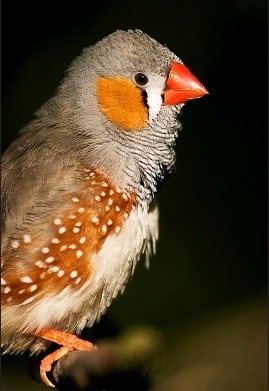 The Zebra finches as pets like to live in a secure and quiet location. Avoid putting the cage where there is direct sunlight or too much temperature. Keep it away from heat, air conditioning ducts and draughts. Since Zebra finches as pets do not need too much of social interaction, you do not need to keep them in the place where people are busy. Ensure that the Zebra finches as pets have fresh water every day. You can use tube water dispensers, dishes or floor. Whatever way you choose to use, you have to ensure that the Zebra finches as pets have always clean and fresh water daily. Food dishes also can be attached on the cage or on the floor but whichever way, you have to ensure that they are also cleaned on daily basis. You have also to provide the Zebra finches as pets a place to bath.